Locking and unlocking the front door when it is well-lit is as simple as stick and twist, but trying to find that little key hole in the dark can be a real pain – and what good are secure entry doors if you cannot get in and hide behind, close and lock them? This is one of those so-simple-and-obvious designs that you almost have to wonder why no one has thought of it: not only does it provide a simple channel for sliding your key down into the lock each and every time, but its distinct shape makes the entire lock housing easier to find in the first place while groping around in poor lighting. Now if only its inventor Junjie Zhang also made it light up on contact to help you while you are fumbling with your keys to figure out which one will actually fit. 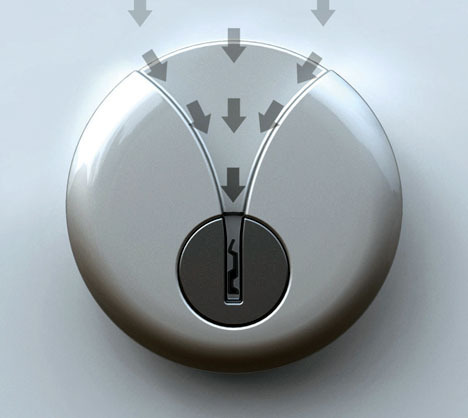 "Its distinct shape makes the entire lock housing easier to find in the first place while groping around in poor lighting." - I agree. 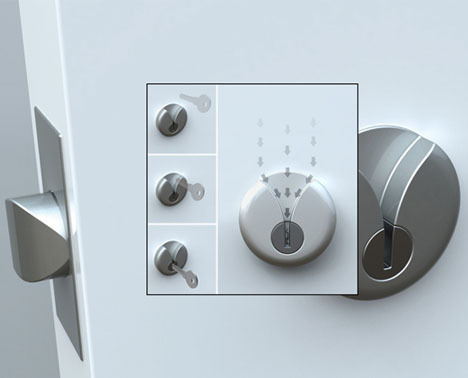 IMO, it is a good idea to make this design universal to all door locks available right now. Never seen a door lock like this, looks great! Well these would certainly make it easier to unlock a door on a poorly lit doorstep at least. Probably would make things more tricky if you're a locksmith Belfast though.